How does Provident Fund support the real estate sector? Buying a house is on every family’s checklist. Whether you are planning to live in it and create memories or rent it out and reap the benefits, investing in real estate is a dream for every Indian citizen. Since more than 70% of Indians contribute to the working population of India, the central government has come up with numerous schemes to make it easier for the general public to buy a property. One such spectacular measure introduced by the Ministry of Labour and Employment is the Provident Fund scheme. As per the Provident Fund scheme, you now have the option of buying a property, constructing a property on a previously owned land, or renovating an owned property with the help of funds accumulated in your provident fund. As per this scheme, you are eligible to utilise 90% of your provident fund deposit after uniformly contributing to it for a span of five years. However, there are a few pointers you need to keep in mind. The measure of using your provident fund to finance your home purchase was introduced by the government in support of the “Housing for All” scheme. According to this scheme, monthly instalments can be paid against your home loan from your provident fund deposit. These instalments will be paid directly to the central government or the housing agency you have subscribed to. This scheme can also be used to fund the construction of a property on a plot or the renovation of an owned property. You are eligible to use your PF deposit to buy a house after contributing to it for a minimum of 5 years. Once you check your eligibility, you can avail an amount equivalent to 3 years of your basic salary. As approved by the Ministry of Finance, an interest of 8.65% can be availed on the total provident fund deposit, extending this benefit to around four crore Indian citizens in the working sector. You can fund the construction of your property on a pre-owned plot with the help of your provident fund deposit. However, this offer is valid only if your construction begins within the first six months of withdrawal and gets completed within a period of 12 months. Even in the case of buying a property, the purchase should be completed within a span of six months after withdrawal. Being an active contributor to the provident fund, this scheme can be availed only by you, your spouse, or jointly by both. Furthermore, the provident fund withdrawals can be scheduled to be taken in instalments as per the demands of the situation. You can even use your provident fund deposit to pay off an outstanding home loan under your name or under the name of your spouse by withdrawing a maximum of three years of your total salary amount. This offer is valid only on loans taken from government affiliated organisations or registered state housing boards. Additionally, you can withdraw an amount from your provident fund deposit even if you want to renovate a pre-owned property. However, the maximum amount which can be extracted for the renovation of a property cannot be more than the salary of one year, and you are eligible for your next withdrawal only after a period of 10 years. To avail this scheme, the property needs to be owned either by you, by your spouse, or jointly by both of you. 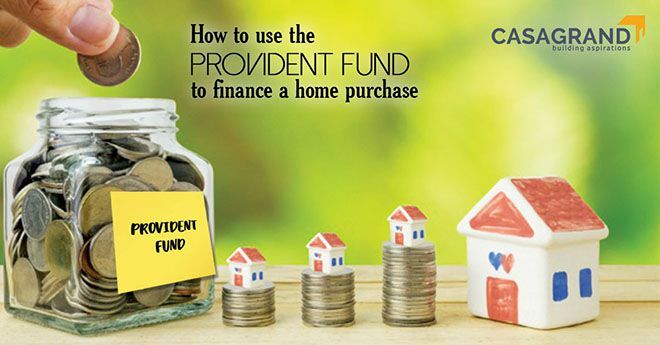 With such immense benefits, using your provident fund to finance a home purchase is the fastest and easiest way to fulfil your investment dreams. You can also check out everything you need to know about the RERA bill, our must-follow tips for first time home buyers, and our detailed checklist of a home buyer’s guide to taxes and duties payable while buying a home for a hassle-free investment experience. Head out to Casagrand and find yourself a house you can call home.